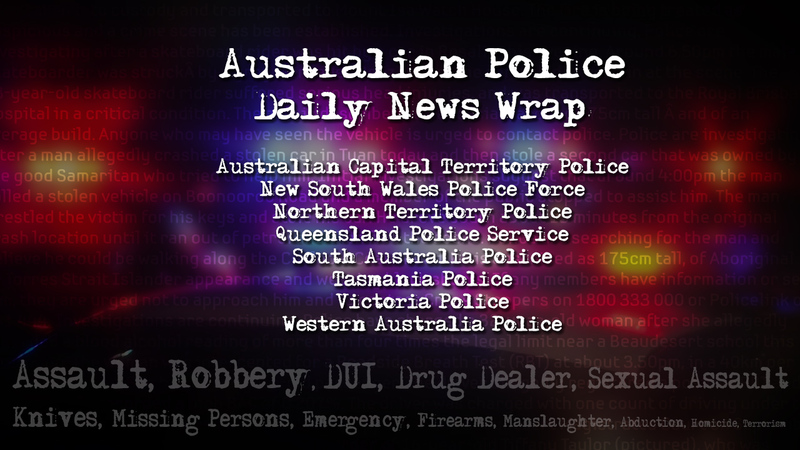 The following are media releases from the past 24 hours by their respective agencies, beginning with the most recent article. Sunbury police took a walk on the wild side yesterday to save a furry mate in need. After receiving reports of a kangaroo hit by a car about 8.20am, Leading Senior Constable Canning and Constable Perkins put their roo-sources together to tend to the animal at the intersection of Racecourse Road and Webb Court. While they were sadly unable to rescue the kangaroo due to the extent of her injuries, they spotted a young joey nearby, who had been left orphaned by the collision. Dubbed Wilbur, the shivering marsupial was taken a hop, skip and jump away to the Sunbury Police Station, where he was kept safe and warm while waiting for wildlife rescuers to arrive. After a quick assessment, Wilbur was cleared of any injuries and is expected to grow up to be strong and healthy. An 80-year-old man has sustained critical injuries after he was struck by a truck in Brisbane City this morning. Preliminary investigations indicate that shortly before 11am, the 80-year-old man was crossing Adelaide Street at the intersection with Albert Street when he was struck. The truck has also collided with a bus. The 80-year-old man was transported to the Royal Brisbane and Women’s Hospital where he remains in a critical but stable condition. The driver of the truck, a 21-year-old man, was not injured and is currently assisting police with their inquiries. A 50-year-old man missing from Westcourt has been located safe and well. Police thank the media and public for their assistance. Police from Central Victorian Response Unit are investigating a number of incidents which occurred in Bendigo over the weekend. On Friday 16 June a white Magna sedan was seen at a criminal damage in Derwent Drive, Long Gully about 3.25am. Three people left the Magna and were seen damaging a parked car before getting back into their vehicle and driving off. The Magna was then spotted in Ligar Street, Kennington about 3.30am where a property was damaged. At 4.15am it was seen at a burglary at a service station in Sandhurst Road, California Gully where cigarettes and other items were stolen. Police are appealing for public assistance to locate a teenage victim following a robbery in Sandringham on Monday afternoon. It’s believed a 16-year-old boy was approached by a man on Royal Avenue about 4.50pm on 19 June. The man struck the victim to the side of the head and demanded his wallet, which contained a small amount of cash and cards. The man then ran off through a nearby park towards Harold Street. An off duty police officer was near the scene and called triple zero (000), however the victim left before police arrived. Police have charged a man with a number of offences following investigations into an armed robbery at a Toowoomba convenience store this morning. It will be alleged that shortly before 5am, a man entered the Ruthven Street store armed with a syringe and threatened a staff member before fleeing the scene with a sum of cash. It will further be alleged that police intercepted the man in a stolen red Mitsubishi Lancer around 9am on Sipples Road in Grandchester. The man was arrested and taken into custody. A 30-year-old Gatton has been charged with a number of offences including two counts of fail to stop motor vehicle, and one count each of armed robbery, enter premises with intent, and unlawful use of motor vehicle. He is due to appear in the Toowoomba Magistrates Court tomorrow, June 22. Police are appealing for public assistance to help locate a 50-year-old man reported missing from the Westcourt area of Cairns yesterday. Peter Powell (pictured) was last seen around 4.00pm leaving an address on Lyons Street, however police believe he may be in the Cairns CBD area. Police hold concerns for his welfare as he has a medical condition. He is described as being Aboriginal in appearance, 165cm tall, with short grey hair and a heavy build. Peter was last seen wearing a white t-shirt and black shorts. If anyone has any information as to the whereabouts of Peter, they are encouraged to contact Crime Stoppers on 1800 333 000. A seven-year-old boy and five-year-old girl have suffered serious injuries from a traffic incident at Pittsworth this morning. Preliminary investigations suggest that around 8:40am, a car struck the children while they were crossing the road, on the corner of Yandilla and Murray streets. Both children have been airlifted to Lady Cilento Hospital with serious head injuries. Detectives have seized more than $1.3 million in illicit drugs and suspected stolen property following the closure of a six-month operation targeting a drug trafficking network on the Gold Coast. Police from Gold Coast Criminal Investigation Branch (CIB) have charged 55 people with a total of 133 drug and property offences as a result of Operation Moonshot which commenced in December, 2016. Five people were charged with trafficking dangerous drugs while four were charged with supplying dangerous drugs offences. In the past week, officers executed 15 search warrants on addresses on the northern end of the Gold Coast including Worongary and Alberton. Police seized more than $500,000 in dangerous drugs including one kilogram of MDMA, 400 grams of amphetamine, 1300ml of GHB and a quantity of steroids and cannabis as well as two commercial pill presses. Detectives also uncovered a pump action shotgun and a Taser during the raids. At least $800,000 of suspected stolen property was seized from the various properties including six vehicles, five boats, six jet skis, 13 trailers, five off-road motorcycles, a Harley Davidson motorcycle and a significant amount of power tools. Kingston police are investigating a truck theft in Braeside earlier this month. Investigators have been told two male offenders attended a Malcolm Road business premises about 8.30pm on 11 June. They parked their vehicle and walked to the front of the business, cutting a padlock to access a secure parking area. Once inside, they took a 1998 Ford prime mover, which has the registration UAI462. A purpose-built site office, which was unregistered, was attached to the truck. Police have charged a man following a police shooting at Cornishtown earlier this month. A 60-year-old Cornishtown man was charged on 15 June with conduct endangering life, as well as firearms and assault offences. He was remanded to appear at Melbourne Magistrate’s Court on 15 August. The charges follow an incident at a property on the Chiltern-Rutherglen Road on 11 June. Police have spoken with two people following a public appeal in relation to an assault in Ringwood last month. A 17-year-old Ringwood boy attended Ringwood police station last night with a family member. He will be interviewed at a later date. A 21-year-old Ringwood man attended Ringwood police station earlier today and was interviewed by police. He will be charged on summons with assault offences. Police are seeking public assistance to locate a 16-year-old boy reported missing from Ipswich. The boy was last seen leaving a residence on Holt Street, Brassall around 9:15pm yesterday, June 20. Police and family hold concerns for his welfare as he suffers from a medical condition. He is described as Caucasian, around 165cm tall with a proportionate build, brown eyes and dark brown hair and was wearing blue jeans. Anyone who may have seen him is urged to contact Policelink on 131 444 or Crime Stoppers on 1800 333 000. This is a joint media release by the Australian Federal Police and South Australia Police. Detectives from the Joint Anti Child Exploitation Team (a partnership between South Australia Police’ Special Crimes Investigation Branch and the Australian Federal Police) yesterday arrested a 55-year-old man from the northern suburbs for two counts of possessing child exploitation material. It will be alleged that some of the children depicted in the material were under the age of 14 years. The man has been granted Police bail and is due to appear in the Adelaide Magistrates Court on 28th July 2017. Benalla police are investigating the circumstances surrounding a theft which occurred in Mokoan earlier this week. Officers have been told nine temporary fence panels were stolen from the Mokoan rest stop on the Hume Highway sometime between 5pm on Monday 19 June and 9am on Tuesday 20 June. Investigators believe that at least 2 people and a large trailer or truck would have been required to move the fence. Two people and a baby have escaped injury after a disqualified driver crashed a car into a tree in the state’s Central West yesterday. Just after 2pm yesterday (Tuesday 20 June 2017), police from Lachlan Highway Patrol signalled for a car travelling westbound along Lake Cargelligo Road, Lake Cargelligo, to stop for a random breath test. The driver allegedly veered into the eastbound lane of the street before continuing into the dirt shoulder and down a culvert. The car then lost control and smashed into a tree. Police will allege the 28-year-old male driver swapped seats with the 37-year-old female passenger while the car was still in motion. A six-month-old boy, who was strapped in the backseat, was unharmed. The woman and infant were taken to Lake Cargelligo Hospital as a precautionary measure. The two have since been released from hospital. Police are appealing for public assistance to help locate Kama Bongiorno. A warrant has been issued for the 26-year-old’s arrest in relation to a burglary in Whittlesea in June 2016. Bongiorno is described as 160cm tall with a medium build, hazel eyes, brown hair and a fair complexion. She is known to frequent Broadmeadows, Brunswick, Preston and the Melbourne CBD. Police have released an image of Bongiorno in the hope someone recognises her and can provide information on her whereabouts. Police are appealing for information after two teenagers were approached by a man in Strathfield last month. Police have been told about 7:00am (Wednesday 31 May 2017), a man approached two girls, aged 17 and 15, who were on their way to school after they left Strathfield Railway Station on Everton Road, Strathfield. Officers from Burwood Local Area Command are investigating the incident. Investigators have released images of a man who they would like to speak to as they believe he may be able to assist with inquiries. He is described as being in his mid 20s, Indian in appearance and about 168cm tall. He has short brown or black hair, bushy eyebrows, brown eyes and olive coloured skin. Police are continuing to investigate a series of armed robberies in recent weeks in Deer Park and St Albans. Investigators believe the incidents, which have taken place in the past four weeks at a service station and two pharmacies, may be linked to the same offender. The first incident at a chemist shop on Station Road, Deer Park involved a man who threatened two people with a firearm about 7pm on 21 May. On 18 June about 6pm a female attendant at a service station on Neale Road, Deer Park was also threatened with a firearm by a man who demanded cash. And on 19 June about 4.30pm a man with a firearm threatened an employee at a chemist on Main Road West, St Albans. Detectives from the Joint Anti Child Exploitation Team (a partnership between SAPOL’s Special Crimes Investigation Branch and the Australian Federal Police) yesterday arrested a 55-year-old man from the northern suburbs for two counts of possessing child exploitation material. The man has been granted police bail and is due to appear in the Adelaide Magistrates Court on 28 July. Police are appealing for urgent public assistance to locate a 52-year-old man reported missing from Arundel. Shayne Ware (pictured) was last seen at an address on Amsonia Court around 6pm on June 20 and has not been heard from since. Shayne is described as Caucasian in appearance, around 175cm tall with a slim build, pale complexion, short blonde hair and brown eyes. Police are appealing for anyone who may have seen Shayne or know his whereabouts to contact Policelink on 131 444 or Crime Stoppers on 1800 333 000. A 43-year-old male constable from South Eastern Region has been stood down from official duty with the Queensland Police Service and will be tasked to perform non-operational duties. The officer is the subject of an investigation regarding the driving of his private motor vehicle while affected by alcohol. The officer was served with a Notice to Appear and will appear in the Cleveland Magistrates Court on 17 July 2017. In keeping with our commitment to high standards of behaviour, transparency and accountability, we have undertaken to inform the public when an officer faces serious allegations of misconduct. This does not mean the allegations against the officer have been substantiated. Police have identified a woman they located in Capalaba today. The woman was found at the intersection of Parkwood Drive and Wilson Court this morning. She does not speak English and could possibly be of German or Dutch heritage. Four young persons have been charged after a police pursuit in Sydney’s south overnight. About 12.20am today (Wednesday 21 June 2017), police were patrolling The Grand Parade, Sutherland, when they attempted to stop a stolen Lexus hatch. The vehicle had been stolen from an address in Rydalmere on Monday. The vehicle failed to stop and a pursuit commenced along the Princes Highway through the suburbs of Kirrawee, Sylvania, Blakehurst, Hurstville, Penshurst, Peakhurst, Padstow Heights, Alfords Point, Menai and back to Sutherland. After the vehicle drove into Delta Place, Sutherland – a dead end – all four male occupants were arrested. A man has been extradited to NSW after being arrested in Queensland over the 2015 murder Sharon Edwards. Mrs Edwards, a 55-year-old mother, grandmother, and dedicated local teacher, was reported missing on Tuesday 17 March 2015. She was last seen about 10.30pm on Saturday 14 March 2015, when she arrived at her home on Riverdale Court, Grafton, following dinner at a local pub with friends. She was due to teach classes the following Monday (16 March 2015), but failed to attend. Strike Force Burrow was established by the Coffs/Clarence Local Area Command to investigate her disappearance. Northern Territory Police have charged a 31-year-old man following an incident in Alice Springs on 2 May 2016. Detective Senior Sergeant Allan Milner said the man was arrested yesterday. “It is alleged the offender assaulted a 41-year-old woman then burnt her clothing,” he said. Police are appealing for public assistance to identify an elderly woman located in Capalaba today. The woman (pictured) was found at the intersection of Parkwood Drive and Wilson Court this morning. She does not speak English and could possibly be of German or Dutch heritage. Her name is unknown, although could possibly be Rosemary. She is described as around 152cm tall with blue eyes and is wearing black gloves, white slip-on shoes with white socks, long black pants, a long sleeved brown top with a shirt sleeve black and white top. Anyone who may recognise the woman or know where her family or carers are is urged to contact Policelink on 313 444 or Crime Stoppers on 1800 333 000. A man charged in relation to six firearms and ammunition seized from a house in Sydney’s south last week will appear in court today. On Friday 16 June 2017, officers from St George Local Area Command were assisted by the Bass Hill Region Enforcement Squad to execute a search warrant on a home at Davies Road, Padstow. Upon entering the premises, officers were attacked by two dogs which retreated to the rear yard after police deployed OC spray. Inside the home, officers located six firearms, including three rifles, two pistols and a homemade shotgun, as well as a quantity of ammunition. Items consistent with the manufacture of illicit drugs and a number of items suspected of being stolen, including a car, were also found. All items were seized for forensic examination. No one was home at the time of the search warrant. Police investigating four linked break and enter offences at hardware stores in the Logan area, have released images of a man who may have be able to assist them with their investigations. Around 2am on June 5, a man broke into a hardware store on Glasson Drive, Bethania and stole shop fittings. On June 13 at around 11pm, a man broke into a hardware store on Commerce Drive, Browns Plains and stole a large quantity of solar pond pumps, lighting and other hydroponic accessories. A Compton Road, Underwood hardware store was broken into around 1.40am on June 16 with a large number of power tools stolen. Earlier that morning the man broke into another hardware store in Springfield, but fled empty handed. The man is described as Caucasian, aged in his 20s, approximately 180cms tall with a proportionate build. He was wearing a dark grey hooded jacket with a grey t-shirt underneath, black Nike track pants with a white motif on his right calve, white sports shoes with shocks at the back. The man was last seen driving a dark blue Toyota Starlet, Queensland Registration 760 KNN. A male taxi driver has been charged with one count of Dangerous Driving Causing Death following a fatal collision with a mini-bus near Shepparton yesterday. The collision happened about 3.30pm at the intersection of Pyke Rd and Turnball Rd, Ardmona. The mini bus was carrying 12 adult passengers while the taxi was carrying two passengers. It’s believed that 12 people have been injured in the incident, some with life threatening injuries. An 80-year-old female passenger from the bus has died at the scene. A man has been arrested and charged after an armed robbery in the Hunter region on Monday. About 10.30pm (Monday 19 June 2017), a stolen vehicle stopped on Armidale Street, Abermain, and two men got out. The men, armed with a shortened firearm and sledge hammer, forced their way into a bowling club and approached a female employee. One of the men tied the woman’s hands and feet with duct tape. The men ransacked the club and later fled in the vehicle taking cash. A man and boy reported missing from Mount Gravatt earlier this month have been located safe and well. Police are continuing to appeal for public assistance to help locate a missing man and boy from Mount Gravatt. They were sighted in Lismore on June 13 however it is unknown if they remain in the Northern NSW area or have returned to Brisbane. They are believed to be travelling and sleeping in the man’s white van. Police and family hold concerns for their welfare due to the absence of contact being out of character. The 56-year-old man is described as Caucasian in appearance, 163 cm tall, slim build and grey hair. The 8-year-old boy is described as Caucasian in appearance, 100cm tall, heavy build and brown hair. Any members of the public who may have information in relation to the whereabouts of the man and the boy are asked to contact police. Detectives are investigating following an armed robbery at a Toowoomba convenience store this morning. Initial investigations indicate shortly before 5am a man entered the Ruthven Street store armed with a syringe and demanded money from a staff member. The man fled the store a short time later with a sum of cash and drove away in a red Mitsubishi lancer. The man was last seen wearing a white hooded jumper with black stripes, a black baseball cap. He has short scruffy brown hair and a beard. Detectives are appealing for any information that might help locate the man responsible. A Woodville Gardens woman has been arrested after she allegedly failed to pay for a meal at a city restaurant and then bit a waiter. Just before 7pm on Monday 20 June, police were called to a seafood restaurant on Gouger Street after a woman had allegedly failed to pay for a meal. On arrival the patrol spoke to a waiter from the restaurant, who stated the woman left without paying for a meal and when stopped she allegedly tried to strangle the waiter and then bit the waiter on the arm causing a nasty cut. The waiter had to be a treated in hospital with the cut requiring stitches. The 48-year-old woman from Woodville Gardens was arrested and charged with aggravated assault and fail to pay for meals. She was bailed to appear in the Adelaide Magistrates Court on 26 July. Officers have been told a man attended the store on Dandenong Road about 5.30pm on Sunday 28 May. Once inside the store the man selected six bottles of spirits and took them to the front counter. The attendant rang up the items and bagged them. The man then asked the attendant for a packet of cigarettes. When the attendant went to get the cigarettes the man grabbed the bags of alcohol and ran from the store. A P-plater has been charged with drink driving following a crash at Strathfield overnight. Just before 11pm (Tuesday 20 June 2017), emergency services were called to Chalmers Road, following reports of a crash. Police have been told a BMW M3 sedan allegedly struck a Holden Barina, a boat and trailer, and a Holden Commodore, all parked on Chalmers Street before coming to rest on the footpath. Officers from Flemington Local Area Command attended and stopped two men walking nearby. A 29-year-old man, who is alleged to have been driving the vehicle, returned a positive roadside breath test and was arrested. A woman has died after being struck by a car in the Hunter Valley last night. Just after 6pm (Tuesday 20 June 2017), emergency services were called to Dalton Avenue at Singleton, following reports a woman had been struck by a car. Police have been told the 61-year-old woman was struck by a Toyota Corolla and died at the scene. The driver of the Toyota Corolla, a 22-year-old woman was arrested and taken to Singleton Hospital for mandatory tests before being taken to Muswellbrook Police Station. She has since been released. Officers from Hunter Valley Local Area Command established a crime scene and are continuing with their inquiries into the incident. Forensic Crash Unit officers are investigating a serious traffic incident that occurred at Logan Central overnight. Preliminary inquiries indicate that around midnight, a pedestrian was struck by a sedan on Mayes Avenue. The pedestrian, a 28-year-old man, was transported to the Princess Alexandra Hospital in a serious condition. The driver of the sedan, a 29-year-old man, was not injured in the crash. Police are appealing for witnesses following a suspicious fire involving six cars and a factory at Tullamarine during the night. Emergency services were called to Derby Street about 12.30am after neighbours noticed a taxi on fire. The taxi was one of six taxis parallel parked on the street, close to a factory wall. The fire spread to the other five cars, destroying all six taxis and damaging the factory façade, before being brought under control. Police will prepare a report for the Coroner after a young girl’s death at West Hoxton last night. Just after 6.15pm (Tuesday 20 June 2017), emergency services were called to a home on Bellerive Close after a 4-year-old girl was found unresponsive in the bath. NSW Ambulance paramedics attended and performed CPR. The girl was taken to Liverpool Hospital in a critical condition, however died a short time after arriving. A crime scene was established and officers from Green Valley Local Area Command will investigate the circumstances surrounding the incident. Police are investigating the circumstances surrounding an attempted armed robbery which occurred in Preston this evening. Investigators have been told an 18-year-old woman from Preston and a 19-year-old woman from Preston were walking along St Georges Road about 8.10pm. They were approached by two females and a male wearing a mask. The group demanded that the woman hand over money. The male slashed the women with a knife when they responded that they didn’t have any. A 12-year-old boy missing from Caboolture since June 14 has been located safe and well. Queensland and South Australian content is published in full; due to legal reasons we can only publish snippets from other states. The content published here may not include photos or videos, please click on the links provided to original articles for more information. The articles are sorted by date and time, starting from the most recent article. This is a strictly non-commercial research project only and as such this document alone should not be used for any purpose; instead please rely on the official Police announcements in the pages linked to from this document.